JJ Carlisle is the worst kind of spoiled; a grown adult with a sense of entitlement and a family that indulges it. Surprisingly, he’s done well or did well. Computer savvy, he hooked up with a tech startup and scored big only to lose it all in the economic crash. Of course, the downturn in the economy is not his fault; neither is the fact that he never saved a penny of the hundreds of thousands of dollars he made. Now he’s broke, angry and looking for someone to blame. Participation in Occupy Oakland is the perfect outlet, and during a demonstration, he’s arrested for assault. 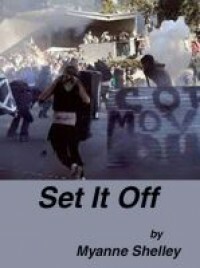 Set it Off by Myanne Shelley sounds like it could be an interesting story with contemporary issues, action and politics. It isn’t and here’s why. Rather than start the story with an action-filled inciting incident - the demonstration and the arrest, Shelley chooses to begin with JJ being bailed out by his sister, Jackie, and step-sister, Karen. The next few chapters flash back to the three character’s childhoods. It’s backstory and not very interesting at that, though there’s a bit of character development and the reader gets a sense of the relationship between the three. Then we’re back to the present, and everyone is gathering for their father’s eightieth birthday. There’s lots of reflection but no drama; not even a family feud. Occasionally, JJ meets up with his pals from the Occupy Oakland movement, but they’re hardly radical and more philosophical than violent. I kept anticipating something would happen, but nothing does. The story just peters out. Shelley writes well. Her dialogue is authentic, and her characters are well-drawn, the problem is they’re unsympathetic. Besides being boringly normal, they’re timid and whiney. But what makes Set if Off so lacklustre a read is the fundamentals of storytelling are missing: Goal, Motivation and Conflict. The goals of the three main characters are so vague as to be non-existent. Without goals there’s no conflict. How can there be conflict when everyone is more or less satisfied with their situation, or at least too unmotivated to do anything about it? Add to that Shelley’s passive writing style - the author prefers to have the characters explain what happens than have them actively engage in the events. These deficiencies represent lack of craft - beginner’s mistakes. They would have been easily identified by peer writing groups or instructors in writing courses. Reading books on how to write fiction can also be helpful though nothing takes the place of an honest, constructive critique by a writing professional. To date, Shelley has published six books (all free except one at http://www.smashwords.com). 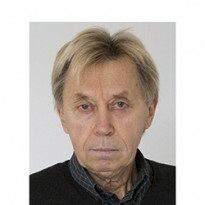 Set if Off was one of her earlier works published in 2013. I’ve certainly improved as a writer since I published my first novel, Saving Spirit Bear. I wondered if Shelley had? I decided to find out. 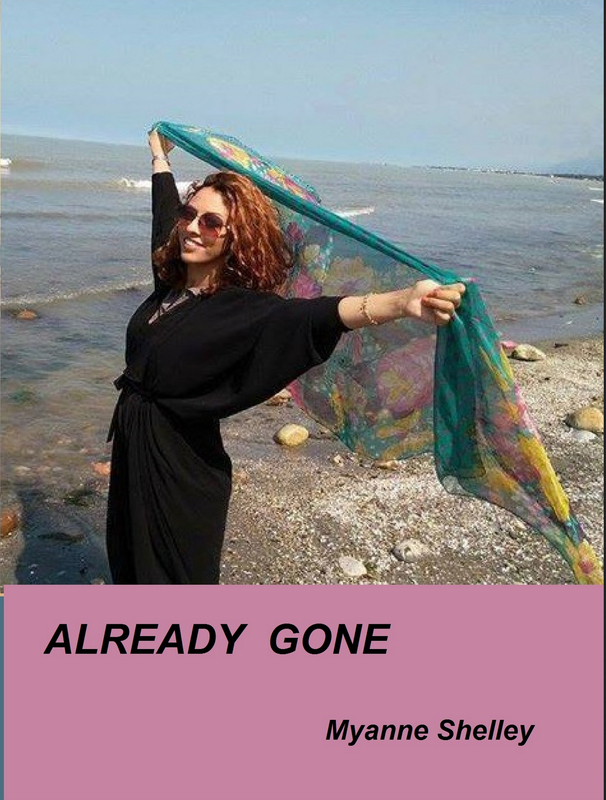 Already Gone is Shelley’s most recent work published in November 2017. Glen and Rachel Voight, a married couple in their fifties, are on a brief vacation to New York City. After a day of sightseeing, Rachel has returned to the hotel to gather her energy while her husband continues to sightsee. She’s waiting for him to return when she learns of a terrorist attack at a nearby nightclub. A man entered the club, sprayed the room with bullets, doused it with gasoline and then ignited it by blowing himself up. When Glen doesn’t return to the hotel, Rachel’s anxiety mounts. When survivors identify her husband as being present at the time of the attack, and a surveillance camera backs it up, Rachel fears her worst nightmare is a reality. His jacket, found at the scene, confirms it. Because many of the bodies are burned beyond recognition her husband’s death is assumed, though never actually confirmed*. Weeks after the attack, Nick, Glen’s brother, finds evidence Glen’s laptop has been used after it was assumed destroyed along with Glen in the fire. Was it stolen from the crime scene before the attack? When further anomalies are discovered including links to secret accounts, Rachel is left to wonder if Glen is dead or has just used the opportunity to disappear? Author Myanne Shelley realistically portrays the emotions of someone thrust into these tragic circumstances while at the same time gradually sowing seeds of suspicion. But her unfolding of the plot takes too long, and in the end, nothing is resolved. As in the previous novel I reviewed, Shelley does not include any dramatic action scenes; she seems to avoid them, preferring to spend the majority of time in her protagonist’s head replaying the events. Though this may be what traumatized individuals actually do, it doesn’t make for exciting reading. Shelley writes well with good dialogue, characterization and realistic relationships between her characters, but her story lacks intensity. The other problem that becomes more glaring as the narrative unfolds with the absence of any startling revelations is the lack of motivation. Why would Glen choose to disappear in such a dramatic way? Why would he inflict such pain on his family and sever ties forever with those he loved? There is no crushing debt, no illegal manipulations of client accounts; no harridan of a wife, nothing that is inescapable. Wouldn’t it have been a lot easier in every way just to walk away from the relationship? People do it all the time. After reading two of Shelley's novels written five years apart, I’d say Shelley’s writing has not improved in that time. Not too long ago I read and reviewed Writing 21st Century Fiction: High Impact Techniques for Exceptional Storytelling by Donald Maas (you can still find the review in its entirety on this site). Maas had a few good ideas, but the basic premise was “go big or go home.” Write big stories about larger than life characters in life-altering situations. Face it, most of us lead mundane lives, at least I do, and when we read a book we want to escape from it and be entertained by charismatic heroes challenged by and intriguing plots. As an author, if you’re not prepared to offer that you’ll have no commercial success, likely no success whatsoever. I’d recommend Shelley read Maas’s book. But even if she isn't motivated by sales, she should endeavour to learn the fundamentals of storytelling. Whether she writes to validate her interpretation of the world, seeks the fulfillment of connecting with readers, or simply to appreciate the satisfaction of producing a well-written story, she needs to hone her craft to achieve these goals. I’d give both Shelley’s books three stars with credit for their evocative covers as well as being professionally produced and edited - error-free. * Evidently, charred bodies can be confirmed through DNA if there is some idea of who the victim might be so a comparison can be made.